On Sunday, we hosted our first design class in our new space! 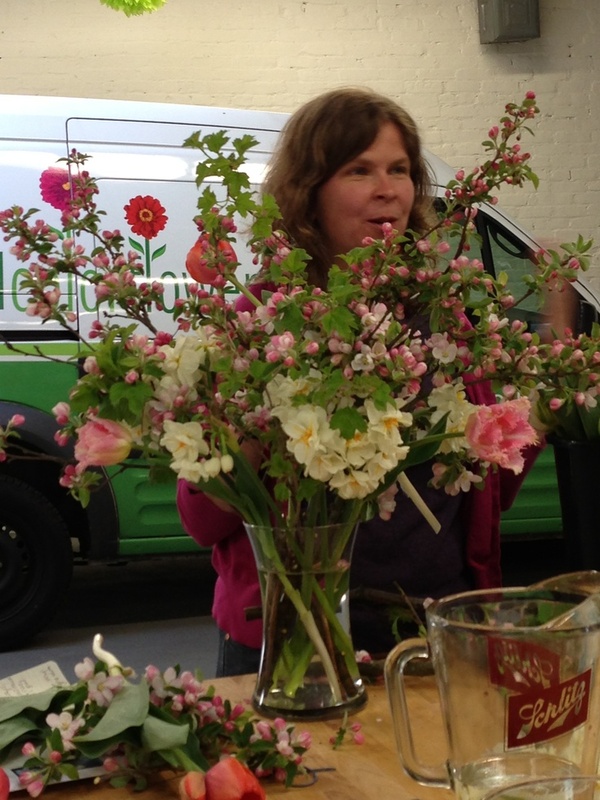 It was so much fun to have folks in the shop getting their hands on flowers! We started out with snacks picked up from the Sunday market including pastries from Chez G and Infused Spreads, treats from the Mallow Bar and the most wonderful salted caramel brownies EVER- from Charm City Cook. After snacks, I gave a brief over view of some design techniques that we use here at LoCoFlo. We usually start with a base-branches, foliage, herbs etc. Then we go to our focal flowers-our WOW flowers. Then finally-all the other bits and pieces the help an arrangement move. We talked a little about color palettes, orientation and scale. Then-I introduced the flowers. This week we had crabapple, sand cherry, wild mustard, red bud, lilies, tulips (in all different shapes and sizes), daffodils, anemones, gerbers, ranunculus and curly willow. Of course we talked about the awesome local farms that contributed flowers to our class that day (Farmhouse Flowers, Plant Masters, Lynn Vale Studios, Locust Point Flowers, Belvedere Farm and the brand new Castillo Flower Farm). Once everyone picked their flowers-the creative magic began! Everyone made gorgeous spring arrangements in a variety of color palettes. The arrangements turned out so beautiful! Here are a couple examples! Carling even took a little video! We’re definitely looking forward to more classes in the future! Keep an eye out for a schedule of upcoming classes and events. We hope to see you soon! For years, I imagined LoCoFlo having a home of it’s own where we could have plenty of fabulous space to work. I day dreamed about space to have consultations and pop-up markets and open houses and design classes. Well, this weekend, it was just like I imagined. Friday, Carling, Irene, Laura Beth and I worked on a variety of fun projects including 2 weddings, arrangements for Kale A Rama, Lululemon, Apothecary Wellness and…the BGE guy (yes-the bge guy came to read the meter and ordered flowers to take home at the end of the day!). Saturday, we opened up the garage door while the Waverly Market was in full swing and sold herb and succulent gardens. We also chit chatted with lots of friends and neighbors who stopped by to see what was inside “that green striped building”. Finally today, we hosted our first design class in our new space! It was so much fun welcoming folks in to try their hand at floral design. All of the arrangements turned out so beautifully! Here’s one example of a finished arrangement. Spending the weekend working is pretty awesome when this is the kind of work you get to do! With our taxes done, and the first quarter of 2013 over, I wanted to take a few minutes to reflect on the impact our little, local, business had on the world last year. I’m not talking about all the people we made happy with local flowers (we did that too!! ), but this is about our FINANCIAL impact on our community. We all know the top 10 reasons to buy local, but the impact of buying local is real-and pretty amazing. Last year was our 5th year in business. It was our busiest year yet and we brought in more revenue than ever before (still not a TON, but good for us!). Here’s how Local Color Flowers spent it’s income last year. Local Growers: The largest part of our budget last year went to local growers. 38% of the money spent in 2012 went to paying 17 growers for flowers, foliage, succulents, herbs and more. We’re excited to to increase that number this year. Locally Owned Businesses: 37% of our money spent went to locally owned businesses. Many of these were small businesses that provided construction services for our new building. Other small business we patronized included the Baltimore Food Co-Op, Zekes Coffee, Atwaters, Grand Cru, the Dogwood, Eddies, Lucy and Amelia, Second Chance and of course the Evergreen Café (my office for the past 4 1/2 years). Local Designers: As we expanded, our local designer pool expanded. We worked with 7 amazing designers in 2012 and we paid them 13% of the money we spent last year. Things We Need to Work On: 12% of the money we spent last year went to “miscellaneous stuff”. Most of this category was filled up with purchases at places like Home Depot for supplies for the space, Pennock for floral supplies and Michaels/Joann’s for ribbon and crafty crap. We’ll continue to shop local for these types of products when we can. As we start or 21013 season, we’re excited to continue contributing to our local economy. Investing in local business and local workers is what helps our community grow. We’re looking forward to continuing to do our part.